Charlie Crabtree was a try-scoring winger who played 171 games for Gloucester between 1945 and 1952, scoring 84 tries. He played two County Championship games for Gloucestershire. With Sid Dangerfield, Ken Daniell, Steve Davies and later Roy Sutton, he was part of an outstanding Gloucester three quarter line in the immediate post-war years. Charles P Crabtree was born in Gloucester in 1925. His family moved to South Wales and he was educated at Coedffranc primary school in Neath before attending Neath Technical College. He represented the college at rugby and athletics before returning to Gloucester in 1941, where he became a student at Gloucester Technical College and played for the Students Union XV. Charlie Crabtree joined Gloucester RFC when regular fixtures were resumed after WWII and played in Gloucester’s first game, against Bristol at Kingsholm, scoring two tries in an 18-0 victory on 29 September 1945. He followed this up with two more in the second game against a combined Richmond/Blackheath XV the next Saturday. The Citizen said “Crabtree coupled speed with a fine sense of anticipation which put him in the right place at the right time. Both his tries were opportunist efforts and he was unlucky in not getting a third in the final minutes.” After this good start, injury and loss of form cut short his season, but he had an outstanding game on 9 March, scoring a hat-trick of tries in a 29-7 victory over Pontypool at Kingsholm, when the Citizen said the backs were in “sparkling form.” He finished his first season as Gloucester’s leading try scorer with 16 tries in 16 games. He started the following season well but again injury in late October and a bout of flu kept him out of the team for two months. He scored a try on his comeback in a 21-14 victory over UAU on 28 December and remained in the 1st XV until the blizzards of February and March 1947 caused fixtures to be suspended. On resumption he injured his ankle and was unable to regain his place. The pattern was similar in 1947-48 when early season success was followed on this occasion by a long spell playing regularly for Gloucester United. 1948-49 was Crabtree’s most successful season. This time he maintained his early season form and fitness, playing 38 games for Gloucester (only Charlie Dunn played more) and was again the club’s leading try scorer with 18 tries. He was chosen to play for Gloucestershire against Oxfordshire in a county friendly at Oxford on 23 September. This was followed by his CountyChampionship debut in a 24-8 victory over Dorset and Wilts at Salisbury on 2 October. He scored tries in both games. Notable performances for Gloucester included scoring both tries in a 6-0 victory over Wasps, the only try in a 5-0 victory over Bath, the winning try in a thrilling 18-16 victory over Leicester and, as described by WB (Bill Bailey), “a glorious try after a 50 yard run, following an open movement initiated ten yards from the Gloucester line” in an 11-3 win over Bristol. Try scoring opportunities were few and far between for Charlie Crabtree in the first half of 1949-50, although he kept his place in a struggling side. However, he broke his ankle late in December and was out of contention for the rest of the season. He was a regular first choice again in 1950-51, although the injuries were beginning to take their toll. At a Gloucester committee meeting on 19 September it was reported that “this player (C Crabtree) expended 5/- each match on bandages. The Players Rep. was informed that these could be obtained by chit from the Hon. Sec.” He played 31 games and was again top try scorer with 10 tries, but the tries were largely scored against lesser opposition. 1951-52 was the Diamond Jubilee of the Kingsholm ground and a record-breaking season for Gloucester. Crabtree was the leading try scorer with 16 tries from 26 games. After scoring a hat-trick against Devonport Services the previous week, he was chosen to play for Gloucestershire against Cornwall on 24 November. The match was played in a gale and drenching rain and offered him no opportunity to shine. He was not picked for the county again. A second hat-trick followed against Wasps in January but perhaps his outstanding performance was against Oxford University on 1 December when he scored two tries in a 24-21 victory which was regarded as Gloucester’s finest performance of the season. 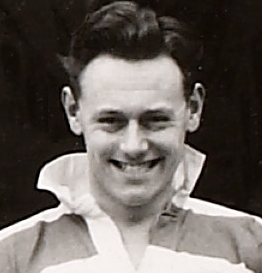 Playing his first game of the 1952-53 season in mid-October, Crabtree then kept his place in the side until the end of the year, scoring the winning try in a 6-3 victory at Leicester and 6 tries in 9 games overall. His last 1st XV game was against Old Merchant Taylors at Kingsholm on Boxing Day. Five more games for Gloucester United followed, including two tries on 24 January, playing in the centre against Bristol United. On 14 February 1953, he played his last game in a Gloucester shirt against Bath United on the Fielding and Platt ground. At the Gloucester RFC committee meeting of 17 March 1953 it was reported that he had tendered his resignation from the club.